QuantsPlus™ will provide users with their own QPF™ – Quantitative Personal Finance experience that will be the future of online investing personalized according to the needs and risk tolerance of active investors, advisors and institutions. QuantsPlus™ is the next generation of online investment platforms and will automate the process of alternative investing with integrated proprietary quantitative risk and return analysis and optimization technology, to potentially generate better risk-adjusted investment returns. 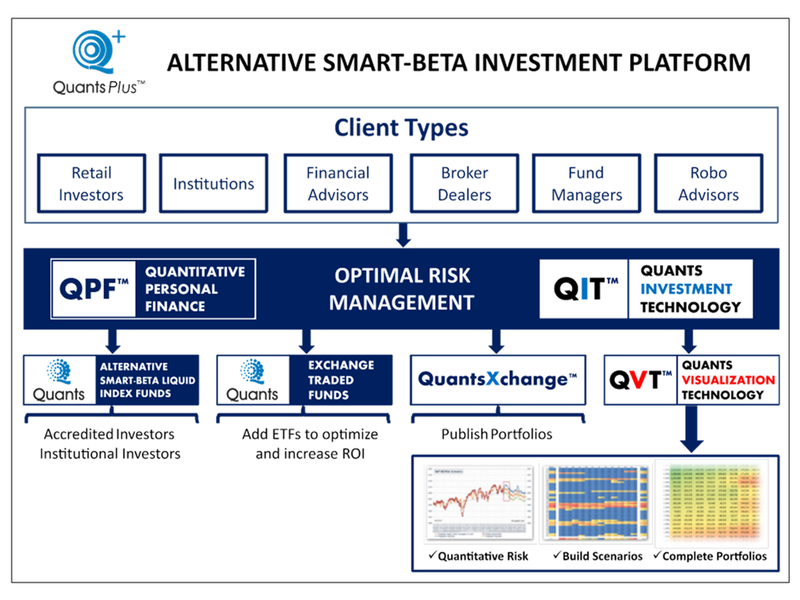 QuantsPlus™ is a first-mover; turnkey digital advice (Robo-adviser) platform to streamline and democratize smart-beta alternative portfolio construction and investing that simplifies risk management and return optimization with derivative ETFs. The platform will analyze portfolios, determine the appropriate allocation of Smart-Beta Building Block ETFs for an optimal portfolio and rebalance them automatically over time. Until now, access to this type of sophisticated quantitative portfolio construction technology has only been available to investment banks and hedge funds due to the development costs and technological expertise required. 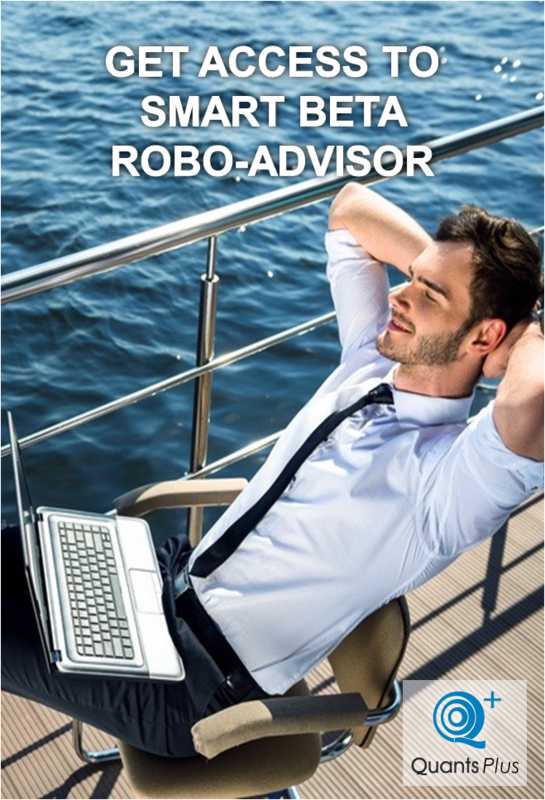 Automated process to analyze portfolios, determine the appropriate allocation of Quants Smart-Beta Building Block ETFs for an optimal portfolio and rebalance them automatically over time. The QuantsPlus™ platform offers QIT™ - Quants Investment Technology that provides risk and return analysis and optimization for portfolios. QIT was developed with the Quants proprietary quantitative risk and return analysis and optimization technology in US derivatives. QuantsPlus™ will provide users with their own QPF™ - Quantitative Personal Finance experience that will be the future of online investing personalized according to the needs and risk tolerance of active investors, traders and institutions. The platform will provide users real time portfolio analysis about the potential risk scenarios with QVT™ - Quants Visualization Technology. Risk scenarios of portfolio are generated with a collection of algorithms to generate real time Visualization Portfolio. The platform will optimize users portfolios with Smart-Beta Exchange Traded Funds (“ETFs”). These building blocks will address the potential volatility in the investment portfolios for better risk management and optimal returns. The Derivative ETFs simplify the complexities, cost, and execution of the strategies structured with derivative overlays. Quants Index Risk ETFs – These dividend paying ETFs trade the most liquid standardized index derivative contracts for macro risk coverage. The trading consists of selling index futures and opening credit spread positions at the implied volatility boundary in real-time. Quants Sector Risk ETFs – These dividend paying ETFs trade stock and sector options of S&P Dow Jones® sectors for risk coverage of select sectors. They will be released after Index Risk ETFs to offer risk and return optimization for any portfolio. The QuantsXchange™ is a portfolio marketplace for the financial service providers with the appropriate compliance at site. The professional subscribers of the platform such as the registered financial advisers, fund managers and brokers will be able to publish their own investment portfolios with the embeddable risk views and optimizations to generate exposure and new investors. The platform will distribute the domestic and offshore Liquid Alternative Smart-Beta Index Funds built to outperform the benchmark equity indices for institutional and accredited investors. The smart-beta portfolio consists of the right combination of asset allocation and risk management strategies. Quants Funds use risk mitigation techniques through the use of passive derivative strategies with their securities portfolios. The QPF™ - Quantitative Personal Finance experience will be the future of online investing personalized according to the needs and risk tolerance of active investors, traders and institutions. Step 1 - Research and analyze new target markets, receive risk scenarios relevant to current market conditions. Step 2 - Enter your current portfolio with a simple and safe API from your brokerage account, obtain tabulated portfolio characteristics, Visually see the current risk you are carrying. Portfolios have the historical risk scenarios embedded in them and the platform can indicate the imminent risk and return potential of your account. Step 3 - Subscribers can visually evaluate the historical performance of model portfolios and customize the allocations according to their risk and return objectives. QIT™ - Quants Investment Technology provides real time risk and return analysis and optimization for portfolios. Quants has Invested over a decade of research on developing and testing the QIT™ - Quants Investment Technology, a proprietary risk and return analysis and optimization technology for investing in U.S. derivatives. Users will be able to have a unique experience with this first-of-its-kind portfolio risk analysis and building technology that up to now has only been available to institutional and high net worth investors. The visualization process called QVT™ (Quants Visualization Technology) allows the investors and their advisors to experience the risk and return analysis in real-time in an interactive manner. QuantsPlus™ will aggregate all details of investments from banking to brokerage accounts. Alternative Smart-Beta Liquid Index Funds built to outperform the benchmark equity indices. The smart-beta portfolio consists of the right combination of asset allocation and risk management strategies. The Quants Fund has the characteristics of an alternative liquid fund as it uses risk mitigation techniques through the use of passive derivative strategies with its securities portfolios. Quants is building Exchange Traded Funds for derivative overlays - Risk ETFs to simplify risk management for both institutional and retail investors. These smart beta building blocks will address the potential volatility in the investment portfolios for better risk management and optimal returns. 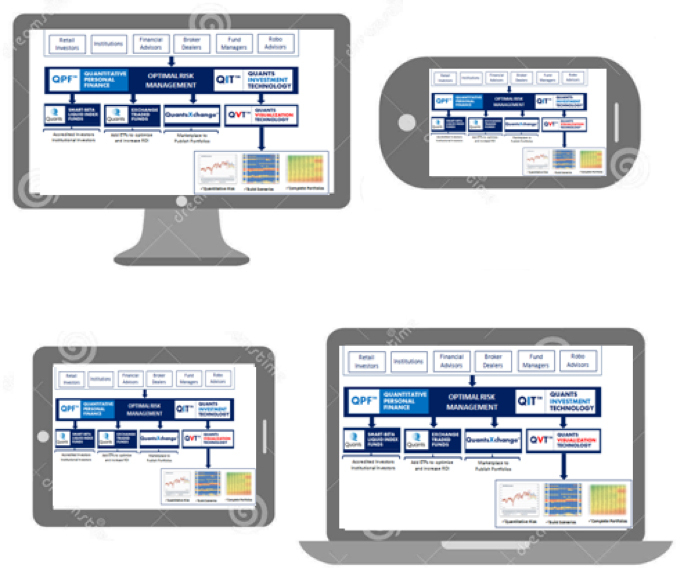 The ETFs simplify the complexities, cost, and execution of derivative overlays. Quants Risk Indices are used in constructing smart-beta securities portfolios to achieve better risk-adjusted returns. Quants Risk Indices continuously measure the potential risk and return metrics of securities portfolios according to the pricing of the standardized index and sector derivative contracts trading on the public derivative exchanges. QuantsPlus Platform (“QuantsPlus” or “Platform”) will be a distribution channel for the portfolio and investment products of Quants Corporation (“Quants”). Platform will support the major electronic securities brokers and connect to the investment accounts of its subscribers. QuantsPlus users will be able to subscribe to the Quants portfolios and Platform will allocate them in their investment accounts. Quants’ and various third party ETF products will be transacted in these portfolios. 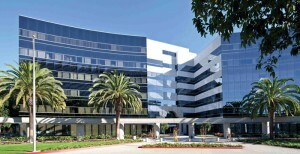 QuantsPlus will use also a custodian/brokerage to accept direct investors. Platform will maintain pricing and risk information for each security covered. Initially, the database will be a small number of index ETFs, but then expand to all global sectors. Each investment portfolio will contain a number of securities, their portfolio weights, and re-balancing criteria. The daily transactions will be also marked for the buying and selling prices for the indexing purposes. The portfolios offered at QuantsPlus will be actively rebalanced according to the portfolio specifications. Platform will allow the grouping of the user accounts (“Groups”) for the registered investment advisers, the referrals from the marketing partners. The accounting of these will be also grouped separately for the affiliation programs. Platform will take advantage of the securities brokers that offer the financial adviser tools. These will be able to streamline the order executions with the block orders for those subscribers using the same broker. Then, Platform will verify the executions at each investment account level. Platform will support portfolio creation for every user and publishing tools. Platform will support a checklist for the RIAs in order to introduce the new investment portfolios and funds for a fee including Quants. Quants (Alternative) Funds will be also offered to the institutional and accredited investors through QuantsPlus. QuantsPlus will use a third party administrator or custodian for the fund investments. Platform will also offer subscription based online risk analysis tools developed by Quants. The risk analysis tools will be implemented after the initial portfolio and execution pipeline. Hence, the initial design process of the infrastructure for the databases and UI modules will be considered accordingly. A quantitative analyst or, in financial jargon, a quant is a person who specializes in the application of mathematical and statistical methods – such as numerical or quantitative techniques – to financial and risk management problems. The occupation is similar to those in industrial mathematics in other industries. Overlay is a management style that harmonizes an investor's separately managed accounts, preventing the formation of inefficiencies. Overlay management uses software to track an investor's combined position from the separate accounts. Any possible portfolio adjustments will be analyzed by the overlay system, which ensures the overall portfolio will remain in balance and prevent any inefficient transactions from occurring. What is Liquid Alternative Investing? Liquid alternatives (liquid alts) are alternative investment strategies that are available through alternative investment vehicles such as mutual funds, ETFs, closed-end funds, etc. that provide daily liquidity. Liquid alts are also known as 40 Act funds because they were created by the U.S. Congress in 1940. What is a ETF - Exchange Traded Fund? What is a Index and Index Investing? Index Investing is a form of passive investing that aims to generate the same rate of return as an underlying market index. Investors that use index investing seek to replicate the performance of a specific index – generally an equity or fixed-income index – by investing in an investment vehicle such as index funds or exchange-traded funds that closely track the performance of these indexes.